Sunday Hunting… Let’s see if we can resolve this dilemma shall we. The whirlwind of debate surrounding Sunday Hunting in Pennsylvania has been a point of contention between farmers, landowners, hunters, special interest groups, and politicians since a bill was first drafted. You do not have to look hard to find a message forum on a hunting website or a comment section on a newspaper article that is 20+ pages long, filled with unyielding and inflexible disputants proclaiming their argument for or against Sunday Hunting is the best and most proper course of action or inaction moving forward. Heck, you might even run into someone in the street or in a store that holds strong convictions on the issue and will opine on the topic whether you prompted them or not. This happened to me while my wife and I were buying her new car. I normally avoid public debates with total strangers but with all the misinformation floating around about Sunday Hunting many people are ignorant regarding the issue so I shared my opinion with the financier at the Chevy dealership who was opposed to Sunday Hunting. I like most informed hunters want to know what others think about Sunday Hunting and normally do not have arguments in public with total strangers about it, however, I find myself completely addicted to reading every blog, message forum, newspaper opinion, op-ed, and magazine I can get my hands on that features the issue. My opinion is Sunday Hunting could and should be a useful and vital tool in managing game in Pennsylvania. 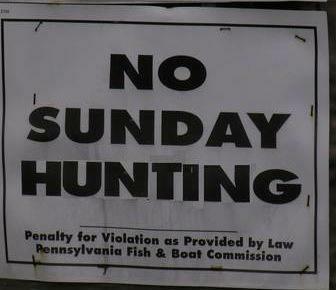 The status quo is completely antiquated and the time for Sunday Hunting in Pennsylvania is NOW. All too often people associate Sunday Hunting only with deer hunting and they forget about all other species. As my good friend Rep. Marc Gergely (D) says, “if it’s Sunday and PA Duck hunter goes to the Delaware river the only thing he can do is watch the people from NJ shoot ducks.” (or something like that) Gergely is right. The proper implementation of Sunday Hunting phased in over time coupled with an initial multi-year ban on Sunday deer hunting would give all the stakeholders time to adapt and adjust, make comments, and if necessary make changes. In order to do this a compromise must be struck and it does not seem the PA Farm Bureau is willing to compromise. Farm Bureau president, Carl Shaffer was recently quoted saying, “Pennsylvania farmers have spoken once again on the issue of Sunday hunting and once again, they have emphatically stated that they want a day of peace and quiet on Sundays, where they can work less and enjoy more time with family and friends around the farm”. What I fail to understand is that no one is saying farmers and other private land owners should lose a day of rest where they can work less and enjoy time with their families. No one is saying private land owners MUST allow Sunday Hunting on their property. Private land owners could very easily post their property to not allow for hunting on Sundays only. This was the focal point of my argument with the financier at the Chevy dealership. The legislature and Governor should add some teeth to the trespassing laws in PA to empower private land owners and give them a little piece of mind knowing if someone trespasses on their property the penalty will be severe and act as a deterrent to other would be trespassers. That might encourage them to post No Sunday hunting signs rather than No Trespassing signs. That strategy worked in Ohio when Ohio first instituted Sunday Hunting and there is no reason to believe it would not work in Pennsylvania as well. It is imperative that we as hunters are cognizant of each private land owners opinions on Sunday Hunting and do everything we can to accommodate a reasonable solution to any issues they may have. I hunt private land. 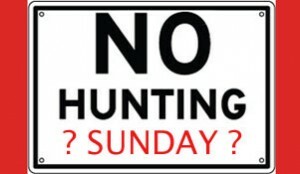 I have discussed Sunday Hunting with my land owners and have told them if Sunday Hunting passes into law AND they do not want anyone trespassing on their property on Sundays that I would help them put up the no Sunday hunting signs myself. Hunters need to be a source of information and support to the land owners that so graciously give us access to their land. 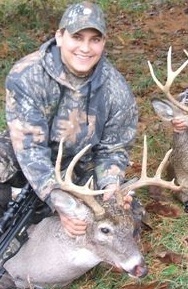 Overall, the PA Farm Bureau is being unreasonable and sportsmen do not help themselves out. Sportsmen need to practice their craft more ethically and remember to treat private land owners with respect. Follow these steps to hunting private land. 1.) Ask for permission! Don’t be a bad apple and taint the reputation of sportsmen everywhere. 2.) Be polite – Remember, you don’t own the land. 4.) Listen – Talk to the land owner and gain an understanding of their expectation for you and your hunts. Remember, your presence impacts their lives. 5.) Share – Offer a portion of the harvest to your land owners as a thank you for their blessing to hunt. As always send your questions to teamsurra@gmail.com and don’t forget to follow us on twitter @SurraOutdoors. I have purchased a hunting lincence for 37 years. My son and I did not hunt this year.Why? Well last year i rained the first 3 saturdays of small game. We hunted the first day of buck for about 6 1/2 hrs where as I got a nice 8 point.We eat one deer any more goes to waste.I will not harvest anything I dont eat. I do not Harvest and give away. So sitting down and figuring out money spent to time hunting it just aint worth it.You see I have a job M-F.If I were retired,disabled,laid off or on welfare I would have more time.You know Ohio is really not that far away. I got my wife threw htuenr saftey a few years back, so that we could spend more time together in the great outdoors, and teach are two kids together as a family about the special time hunting. My kid’s love it, they are 9 and 12, and have been hunting with me since they were old enuff to walk. Recently I submitted a photo of her with a whitetail she harvested in Idaho last year, which of course is bigger than any I have harvested. And know she has the braggin rights. Thanks for printing her picture. She’s pumped for what next year will bring! They killed off too many deer as it is, give them sundays to mismanage even more for the sake of environmental nutjobs at the expense of hunters? No thanks. Just fix the fraudulent deer management so we can actually see decent numbers of deer. Don’t need sunday hunting to fulfill antideer political agendas.